It’s hard to elicit raw terror in book form, especially in the opening pages. If the book is 300 pages, you know there is still plenty to come. Real life, however, is a gut-wrencher. For instance, there’s no guarantee I’ll finish writing this review—or that you’ll finish reading it. That’s why well-crafted nonfiction, such as Bill DeYoung’s Skyway, can induce frights greater than most horror novels. 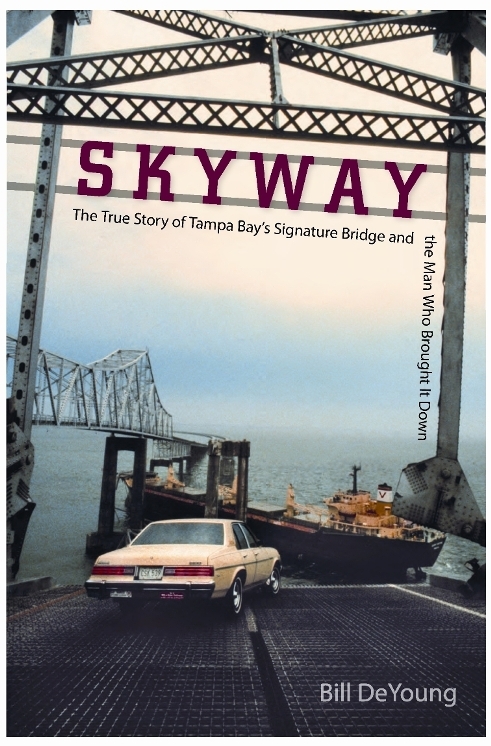 I white-knuckled it through the first two chapters of Skyway, a recounting of the Skyway Bridge disaster of 1980, and was impressed with DeYoung’s narrative talents from stem to stern. Some background: In 1980 a harbor pilot, John Lerro, was guiding a ship to the Port of Tampa. A freak storm unleashed a nightmare scenario, and without radar or visibility, the ship, the Summit Venture, struck the bridge, collapsing a span of road 150-feet high. Thirty-five vehicle-bound victims, including passengers in a Greyhound bus, plummeted to their death. It’s a tragedy mostly forgotten outside of Florida, but DeYoung’s brilliant account should change that. With a narrative journalism style, he fleshes out the events of that morning with factual data, news reports and first-hand accounts. We share the helpless terror of the Summit Venture crew as cars plunk into Tampa Bay. We white-knuckle it as a car grinds to a halt inches from the drop. We cheer as motorists band together to halt oncoming traffic and shut down the bridge, saving countless lives. And then the book really gets good. DeYoung, a longtime journalist, gives us a longitudinal view of the disaster, from the rise of interstate commerce that necessitated the bridge to the haunted lives of the Skyway survivors decades later. Some of the most interesting bits concern the role the interstate system and mid-20th century financial culture played in building the bridge (and cutting corners from construction to upkeep). Though it was Lerro who took the blame, it was greed that forced the harbor pilots to take chances in foul weather. Also in play was the exclusionary, good-old-boy culture of the harbor pilots, which deeply scarred Lerro (who was exonerated of any wrong-doing, and in fact was commended for preventing more deaths) following the tragedy. Skyway put me in mind of Nathaniel Philbrick’s In the Heart of the Sea: The Tragedy of the Whaleship Essex, which is about as high a compliment as you can pay an author of narrative history. Maybe I’ve just got a thing for maritime disasters (I blame Poe and Arthur Gordon Pym for that), but Skyway is a chilling, informative and deeply engrossing narrative. This is a book worthy of awards and deserving of the bestseller list.